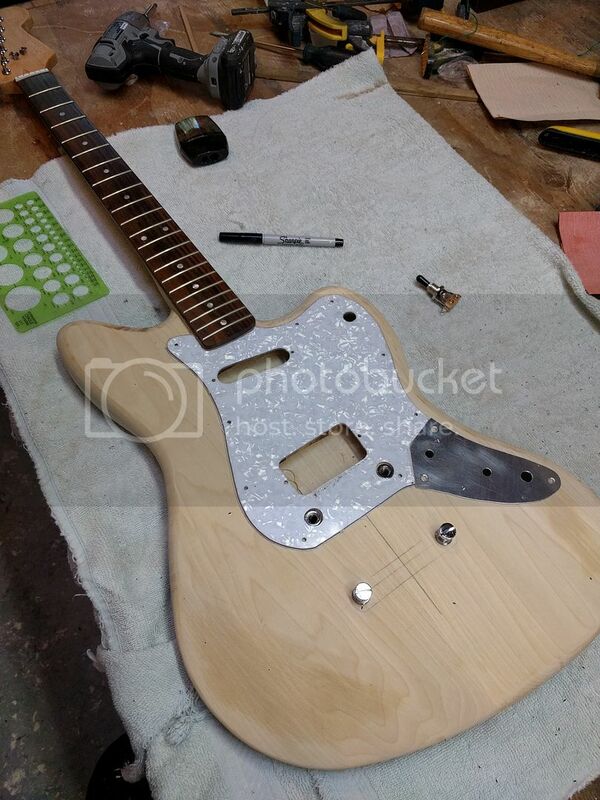 ShortScale :: View topic - This is my project guitar...Jazzmaster type thing. 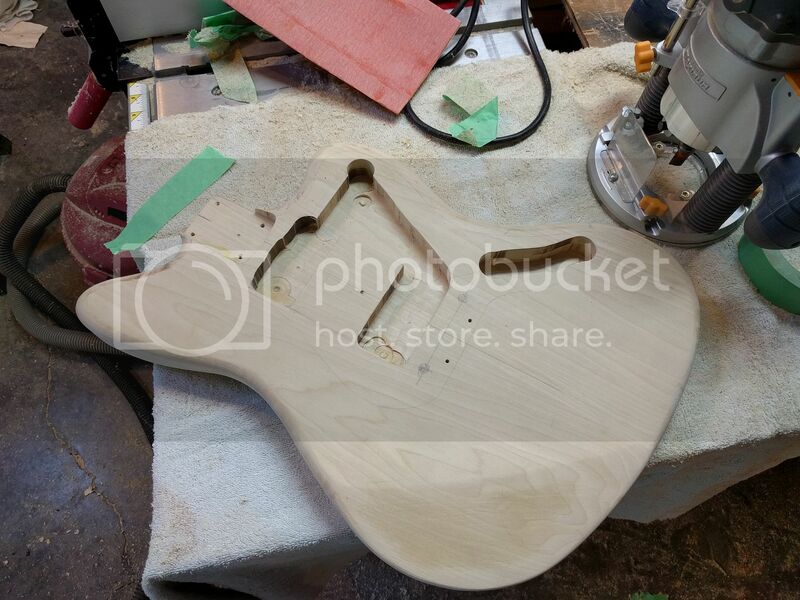 Posted: Wed Aug 24, 2016 2:01 pm Post subject: This is my project guitar...Jazzmaster type thing. Its been far too long since I've posted here. I thought I would share a build I just recently completed, been a long time coming. I originally set out to build myself a Jazzmaster, but as I started making templates and such I figured I may as well build something a little more unique and maybe inspired by guitars of days long passed. So I set out to collect parts, and one source pleasantly surprised me. I ordered most of the hardware from retailers on Aliexpress. 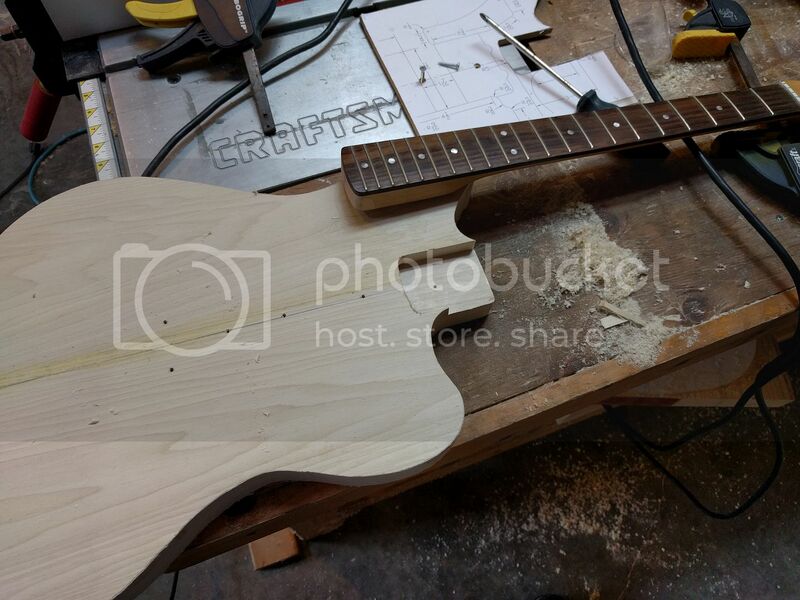 There is tons of stuff on there for guitar building. I also collected the neck from a Squier Bullet Strat, bought from a kid who was selling his guitar and amp so cheap that I can only assume it was because he had no idea of what these things really cost. Probably a spoiled brat who got it for christmas and never really played it. Anyway, the neck isnt the best, but I didnt want to invest too heavily into something I could have completely fucked up. 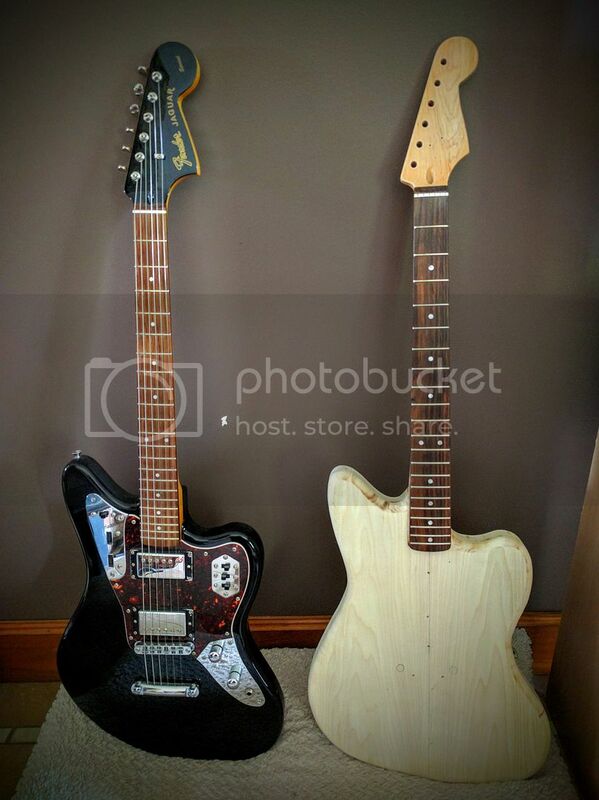 The pickups are shite too, will have to replace them along with the neck at some point. 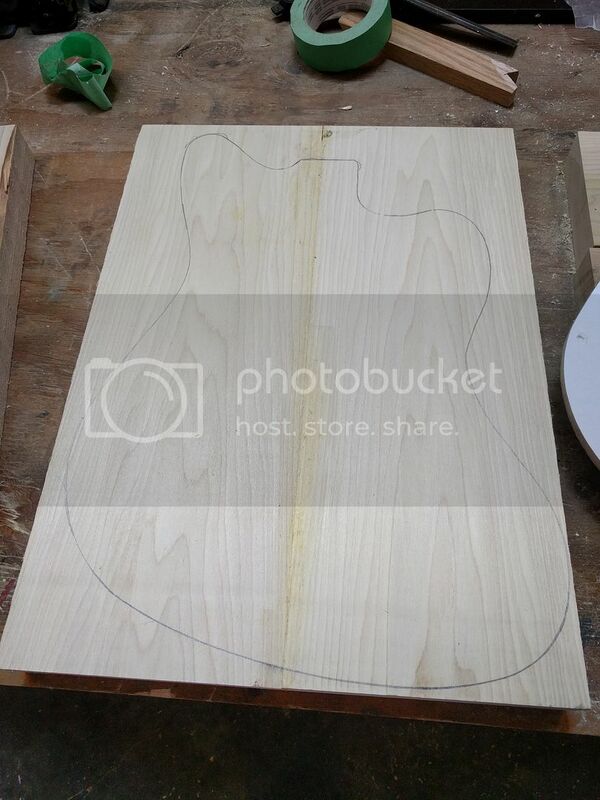 The body wood is poplar. Bought enough lengths of 8/4 wood for about 4 bodies. 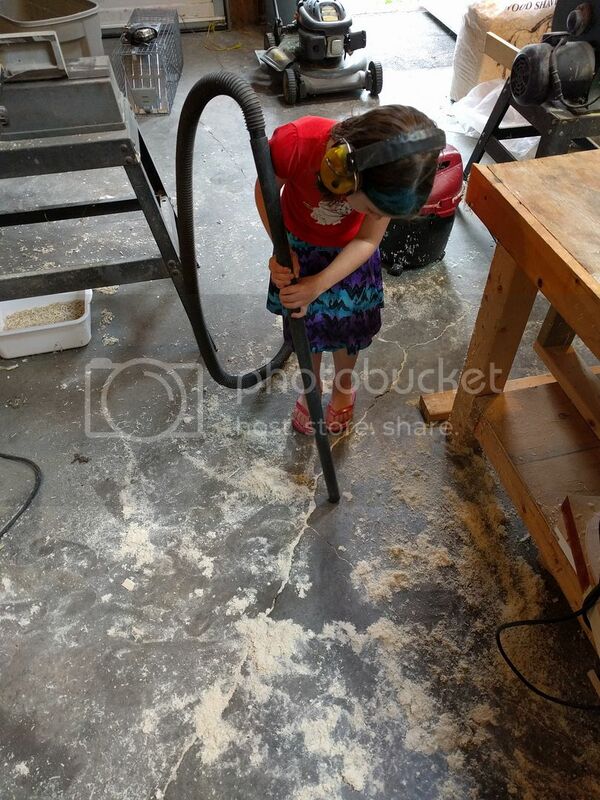 My daughter helping me clean the shop as I build this thing. I like the hardtail, pickguard shape, and color. Nice project. Great job! Sorry about your eye. Thanks...I guess I have to invest in a good pair of goggles. 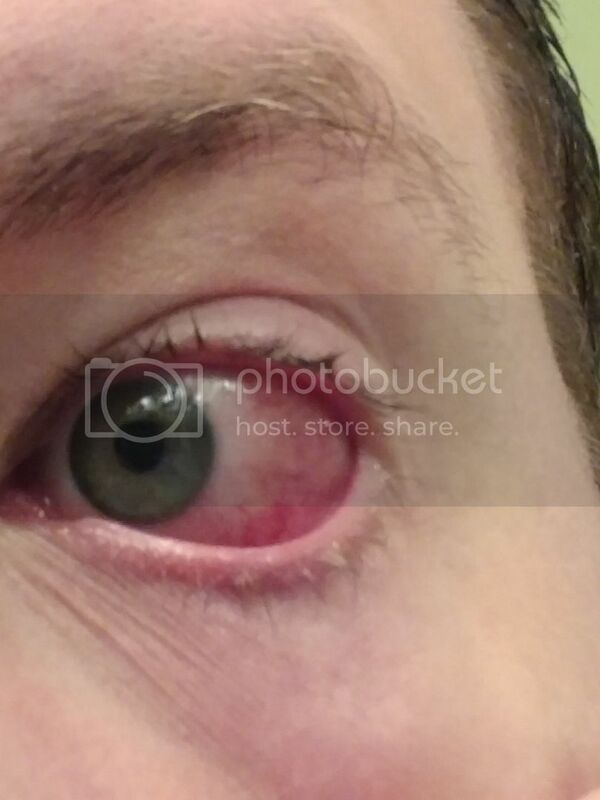 Safety glasses are good and I did have them on, but without side protection you can still get particles in your eyes. My next project is going to be a Mustang style, already have the body cut out. Just need to source a neck. All of this. A+ job. I'd probably buy that if Squier made it. Seconded. I even like the colour (been lusting after something CAR for a while) and matching headstock. It's like a Cyclone that I wish Fender would actually make. I can't wait to see what you do with a Mustang concept as well. 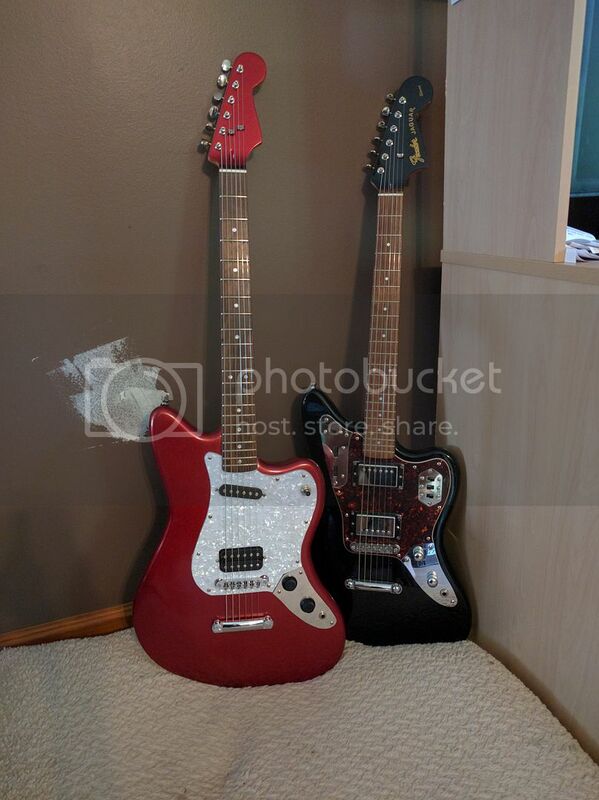 I've been on the look-out for a Bilinda-stang (aka a Mustang with a JM/Jag trem) for ages, an even toyed with the idea of trying to squeeze a pair of JM pickups into a Mustang body. P-90s shouldn't be too much of an issue, but the JM-sized soapbar type might be a bit of a struggle. If the Squier bullet strat was one of those old 80s Korean-made ones, you've got yourself a winner. My first guitar was one of those, and the neck was great. Really slim and comfortable. Oh no it wasn't an 80's one. Def a Chinese made one from these last few years. That's why I say it will need replacing at some point.